Mineola, New York, USA. January 1, 2018. Speaking at podium isU.S. 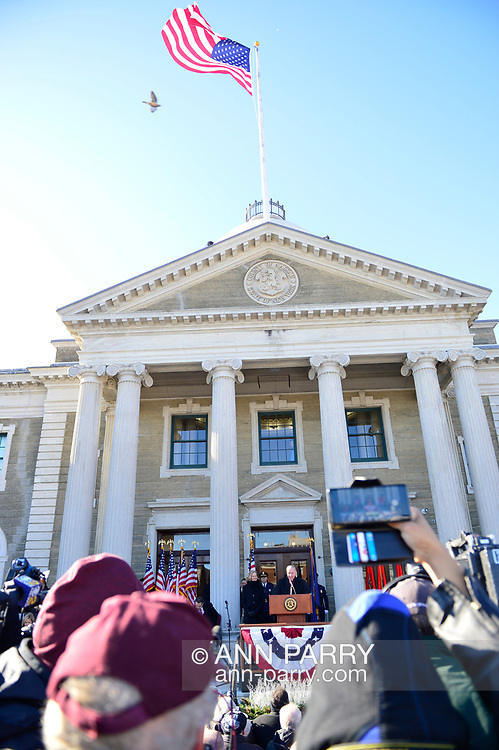 Senator CHUCK SCHUMER of New York, and left of him is Nassau County Executive LAURA CURRAN, at historic swearing-In of CURRAN as County Executive, the first female County Executive. Temperature was a freezing 14 ℉ Fahrenheit / -10 ℃ Celsius for the outdoor ceremony held in front of Theodore Roosevelt Executive & Legislative Building, and people in audience stood close together on and near the vast entrance stairs steps. Bird flying toward waving American Flag atop building.